Now that a month has passed, I’ve had time to reflect on the show. The thing that comes to mind first is that there are advantages and disadvantages of seeing a show early. The advantage is obvious: seeing the show early. I get to see it before all of the footage, photos, reviews (i.e. spoilers) affect my opinion. I try to keep a wall around myself, but it has gotten harder over the years simply because of the sheer volume of content that comes out after a show. So the earlier I get to go, the less the content. That’s a good advantage; but it ends there. The disadvantage is that it takes a while for our boys to iron out the wrinkles. In some tours they do it very quickly while others took much longer. I remember seeing them at PopMart ’97 in Oakland and even though they had been touring for a couple of months, they seemed a but unsure of themselves. That’s the best that I can describe it. After Zoo TV and Zoo TV Outside Broadcast, my expectations were high. They didn’t seem to have the confidence and swagger of the last tour and it was noticeable. There were six people in my group and we were all talking about it. One of my friends said, “Something’s missing.” I agreed with her even though I still loved the show. I read an article years later that detailed how the band was behind on the release of Pop and didn’t have enough time to rehearse before the tour launched. The good news is they found their legs by the time they hit Europe and were back to full form. With that in mind, I figure the band needs to time to find their rhythm. As well-planned as this tour is, the show at Levi’s Stadium (Santa Clara, Ca.) lacked the dynamism of i+e 2015. Some of that was marred by our experience at Levi’s (more on that later), particularly the staff. From the moment the show kicked off during i+e, I felt that it was going to be incredible; and it was. Seeing the gigantic screen for Joshua Tree 2017, I felt the same excitement. Yet as amazing as that screen is, it functions to strengthen the performance of the band. This is where I was hoping that they would bring the thunder and lightning, as they have so many times in the past. One of the greatest things our Dublin lads do is perform at high level when the lights are the brightest. There is a fine balance between well-scripted and extemporaneity and this is where they shine, most of the time. It does feel a bit sacrilegious to give anything other than high praise, so it feels weird. But now that I am older and have seen a decent amount of shows (28) I am trying to be more objective. Ever since Elevation ’01, I felt that the band has been getting better and better at live performances. 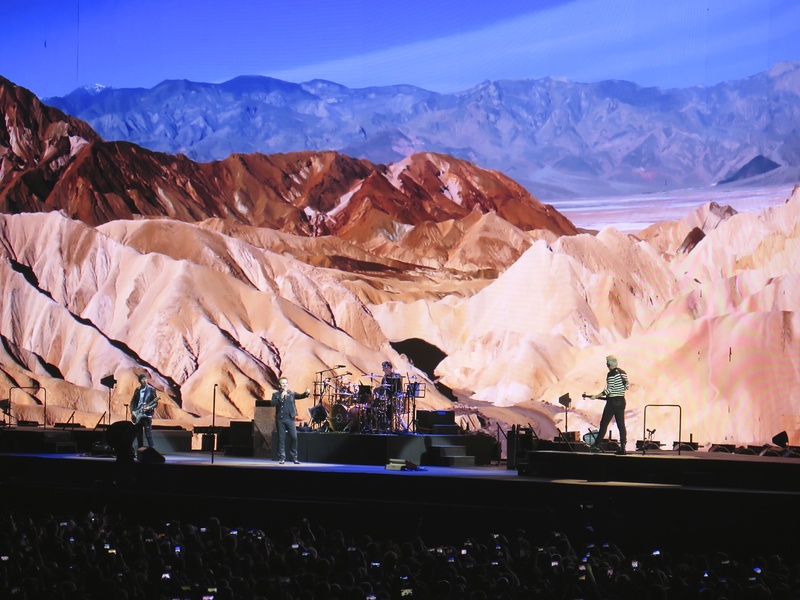 Going into Joshua Tree Tour 2017, I tried not to have expections while knowing that this was a celebration of their landmark album. This was the album that turned me into a fan, so to say I was really looking forward to it, would be a huge understatement. Again, I wanted to “go in fresh” so I avoided anything that even mentioned the tour online. Cutting right to the chase, the band opened on the satellite stage and launched into Sunday Bloody Sunday. It was a great way to kick off the show. They followed with New Year’s Day, A Sort of Homecoming, Bad and Pride (In the Name of Love). What I slowly realized was that they were playing all their songs that predated TJT, which was so cool. By then, the crowd was thoroughly warmed up and the band migrated back to the main stage to play the entire album—in order—without interruption. Nice. By now it must be safe to say that nearly all of us have seen WTSHNN performed live and while a fan-favorite, how can it be re-experienced after thirty years? It can, and happened to me during the Elevation Tour ’01. There was something about that performance—and it helped being the in the heart—that took me back 14 years to 1987. I always thought it was the way Bono sung that song that reminded me of the first time I heard it live. For all of the ostentatiousness of PopMart and Zoo TV, the restrained production of Elevation actually made that song sound better. For me the magnificence of the song is its wide-open nature. It was meant to be performed in front of a crowd. 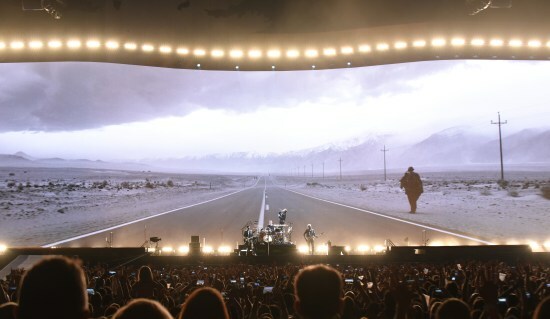 One of the best moments of the show was the beginning of song and it reminded me of a very similar performance during the film Rattle and Hum. As many of us know, most of the film is in black & white, except for a particular section. At the moment WTSHNN opens the screen is filled with the color red from the backdrop and the band members walk onto to the stage and take their positions. I always loved that because of the dramatic way color was introduced. I believe the band had this idea in mind when they kicked off the song. That gigantic screen turned red and it was awesome. I also knew something would be displayed during the song, but didn’t know what. From what I learned later, Anton Corbijn filmed much of the content and he was the right man for the job. The moving image of a two-lane desert highway with jagged mountains in the background and beneath a cloudy, angry sky is so strikingly beautiful, I wanted to stop recording with my Canon G-16 and just enjoy the song. But, I really wanted to capture the entire song and focused on the task at hand (I will post the recording soon). The combination of the video and the performance gave the song a new dynamic. For me, this was the high point of the show. The band was in full stride, Bono was in his element and that immense screen was the choir. I will mention it was at this point that much of the cold dissatisfaction of being at Levi’s began to melt away as I began to remember how much I loved hearing this song live. I actually liked this version more than the version during i+e 2015. Well, that’s it for now. I will post the video in my next article. This entry was posted in Uncategorized and tagged #JoshuaTreeTour2017, #LevisStadium, #U2TheJoshuaTree2017, u2 by achtungninja. Bookmark the permalink. My wife and I take vacations when U2 is touring. We pick a city we haven’t been to where the boys are playing….works out great…Amsterdam for I and E and Seattle for this one(we live north of Boston). I loved the show, but I think we got the best setlist that night of the whole tour, so far. We heard Bad instead of MLK, we heard A Sort of Homecoming, We heard The Little Things That Give You Away, and they came back out and did I Will Follow. If I had been going to the Boston show, which is tomorrow, I think I would be very disappointed in the shrinking setlist. Hearing JT is great, but there was quite a bit of buzz over the band featuring A Sort of Homecoming, and they dropped it. Since then, it is migrating to a very safe setlist, and one that is about 4 or so songs shorter than last tour. Are they getting tired? You gotta wonder. My overall feeling is I saw a great setlist in Seattle…Since then, I think they have just really gotten safe, and their show is coming in at about 2 hours, I think…..holding my breath that this isn’t the end of their knack for outdoing themselves every tour. I always tell people I continue to see them because they are still at the top of their game. I hope I can continue to say that. Angry Liberal, thanks for reading and sharing your experience. I love the idea of seeing a band in a new city. And I’m envious that you’ve seen them in Boston. For what little I know, the band has a special affection for Boston and their shows there are awesome. I also agree that they might be moving over to a safer setlist. They might be getting tired or responding to critic and fan reviews of the show, or waht is more believable is that it might be both. It’s a bummer for sure. We were lucky and got to see the perform ASOH at Levi’s Stadium (Yeah!) and it’s a song I wish they’d keep on the list.